Making A Scene The Nashville Way! They say the age of the “Selfies” has entered, and now, Stardust Tea And Spice must join the ranks, especially since a kind person by the name of Lesley Lassiter mentioned us in The Nashville Scene. As a small business trying to compete against big giants, loyalties get pulled in all directions these days. 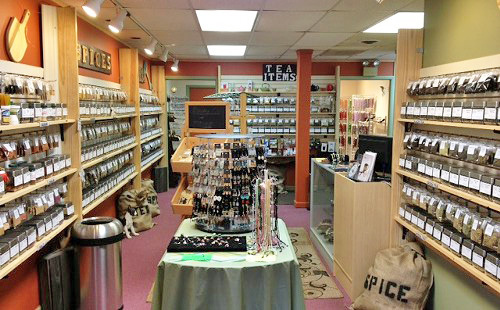 Wanting to find new ways to amp up the shop, we thought adding teas and spices made a nice fit with jewelry crafting, since so many people associate all these things with comfort, happiness, and feeling good. And the nice thing we can tout for the holiday season is the introduction to our new eCommerce site where you can buy teas and spices online! So if you’re up late at night, or you don’t have time to run into the shop, you can order in the comfort of your home and pick up the merchandise at the store or have it shipped to you. We’re always trying to add new blends and flavors to our collection, as well as fun, useful accessories. The most interesting thing I’ve noticed is customers who come in to purchase teas, spices, and accessories for friends and family. Before we delved into this area, we’d never considered gift-giving to include these items. So you see, we learn from our customers every day! And it’s true, sometimes the best things can be found in your own back yard! Habanero Sugar: Hot, Hot, Hot! Many of you are wondering what’s up with the funky sugars we have at Stardust Tea and Spice. When it comes to salts, which we have plenty of and in all kinds of varieties to boot, most people understand quite well what that is and mostly how to use it. But the sugars seem to flumox most everyone. If it’s not the white processed kind, or at least the raw variety, we tend to scratch our head a little, perplexed. Now’s the time to step outside the box and experiment some, especially with all the fun sugars we have. Because we’ll most likely feature each sugar with its own post, we’re going to start with the hot Habanero sugar first. Here is the first question we always get about this one: What do you do with it, exactly? That’s okay, we understand. This sweet sugar, with the extra added zing that’ll set your mouth on fire, doesn’t have to be an enigma. First of all, you can use sugar in your general cooking, from rubbing on meats to adding to sauces. But let’s think about the properties of sweet and hot blended together. If you look at some of the products on the market today, you’ll see chocolate and pepper paired up to create yummy, gormet confections. Adding this sugar to spaghetti sauce will definitely up the hot notch on your dish, while adding just a hint of sweet. If you make some hot chocolate, add just a pinch (and we do mean pinch) to your cup. Want to make a zinger of a chocolate cake, why not add some of this sugar to the frosting and make your dessert stand out among the crowd. One customer said she threw a little of this sugar into her smoothies, and she enjoyed the taste and the twinge of sting hitting her tongue when she drank her juice. Now that was creative, for sure! The best thing to do is to experiement and try things out. Because this particular sugar has fire to it, we suggest you go easy on it–very easy! We’ve finally done it! We’re introducing Nashville to a wonderful collection of teas and spices. No more dull food and drink any longer! If you’re wanting to receive the ultimate benefit from healthy herbs, you don’t have to look any further than us: Stardust Tea and Spice. We’ll be starting off with a fun collection of loose teas and flavored sugars to kick off your sipping pleasure, and beginning January 2013, we’ll be adding a host of spices for your cooking needs. For all you people who indulge in herbs, we haven’t forgotten you! You’ll also get to choose from an eye-watering assortment of wonderful, healing herbs for your personal use, whether you use them for drinking or incorporation into body products. Accessories: We won’t be forgetting these, either. From straining straws, to infusers, to scoops, we’ll have a nice variety of helpful items to enhance your tea and spice usage experience. Again, we’re happy to start this collection, and we hope you’re just as excited about this venture as we are!